This card speaks for it self, then whispers sweet things in your ear when you dont expect it. Its one of the most powerful tutors you can find, here's why: 1 and 3 get you: One free turn to use near any icebreaker you want, regardless of cost. One turn to exploit superpowered super expensive icebreakers like Femme Fatale or Torch for just a 3 "install" cost. After youre done with what was hopefully a fruitful turn, the tutored card goes to the top of your stack, which means it is ready to be drawn and installed, no useless random draws blocking your path. At first glance you might think this is where this card ends in its usefulness, but wait, theres more! For starters this card can recover discarded cards, thats great by itself. 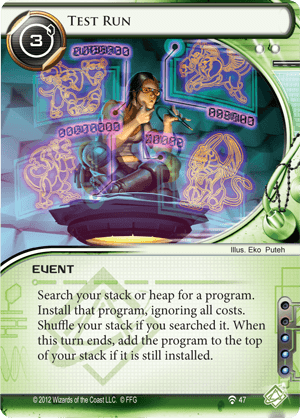 The fact that the tutord card goes back to the stack is a downside, a "cost" to balance against Test Runs great power, but there are some cards where this is actually an upside. The most obvious raw power synergy is with the limited-charge breakers that have surfaced in recent expansions, Overmind, D4v1d, Cerberus "Cuj.0" H3, Cerberus "Rex" H2 and Cerberus "Lady" H1. Test run lets you play the breaker and use some counters, then later you draw and reinstall with fresh counters! Combine with e3 Feedback Implants to potentially double the effect. A few programs and breakers need/can select targets, such as Femme Fatale, Cyber-Cypher and Knight, with test run you can target different targets with each install, though not allways needed this option can come in handy in certain scenarios. One more synergy worth mentioning: If you Scavenge the Test Run card, that makes it permament, no returning to the stack, this combo play can easily pay your way to victory.